St. Lucia Vinyl Strap Chaise Lounge made with an Aluminum Frame. Commercial Pool Furniture. St. Lucia Dining Chair, Vinyl Straps with Aluminum Frame. Commercial pool furniture. St. Maarten Cross Weave Vinyl Strap Dining Chair with Aluminum Frame. Commercial Vinyl Strap Pool Furniture. 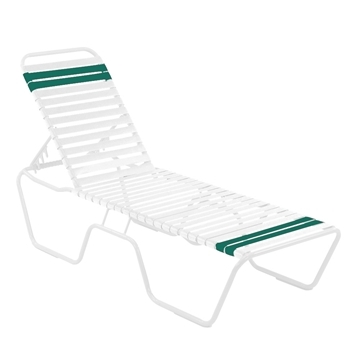 St. Maarten Cross Weave Vinyl Strap Chaise Lounge, Aluminum Frame. Commercial Pool Furniture. Country Club Vinyl Strap Chaise Lounge with Extended Bed Aluminum Frame. Commercial Pool Furniture. Neptune Vinyl Strap Outdoor Bar Stool made with Aluminum Frame. Commercial Vinyl Strap Pool Furniture. Picnic Furniture's commercial vinyl strap chairs and chaise lounges are built to withstand daily use in hotels, resorts, HOA'S, apartment buildings, and country clubs for years to come. These strap chaise lounges are crafted from 100% virgin vinyl strap, meaning the material has never been used on another product ensuring its longevity and strength. Our vinyl strap products are all "double wrapped" and are highly customizable with 26 strap colors, 24 accent strap colors, and 23 frame finishes. Our commercial grade frames are constructed using powder-coated aluminum designed to resist harmful weather effects such as corrosion and rust. Picnic Furniture's vinyl strap furniture is proudly made in the USA with a 5-year commercial warranty provided. Heavy duty aluminum strap pool furniture is the standard for hotel and resorts around the world. All of Picnic Furniture's vinyl chairs and chaise lounges are made in the USA to the highest quality standards. Provide comfortable and stylish seating to your pool patio by ordering one of our commercial grade vinyl strap products. Call our professional staff today for a personalized quote or information on quantity pricing.